A selection of Balfron memories by older residents. More to come - I hope! I am the cyclist on the left. Can't remember who my friend is. So long ago! There is another photograph of us cycling down Buchanan Street taken from the junction at Dunmore Street. I have two postcards of this one and they have been 'touched up' showing different clouds etc. If I can manage to upload them I will. Barbara MacDonald (nee Brown) from Printers Row. 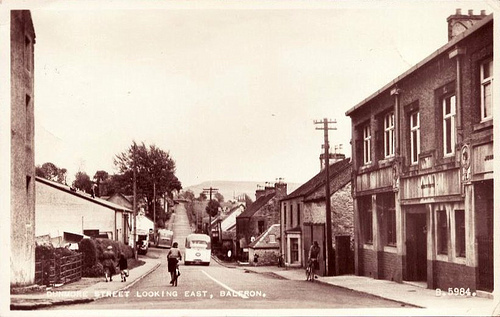 I am trying to find out about the co-op in Balfron around the time of 1918, when my great granda was manager. I have visited Balfron and contacted many people, but no one seems able to help. I'd like to find out where the original co-op building was - not the drapery at the bottom of the hill, but the grocers. One suggestion is that it was in the building which is now a shop called Wonderland. Can anyone help? I'd be very grateful for any info at all! Hi Norman,my maiden name is Sinclair.Dad,was Duncan.Mum, was Mary nee Battison. You were talking about White Yett.My grandpa was born there.He was George Battison. No, that's not a photo of the Coop. It was on the other side of the road. 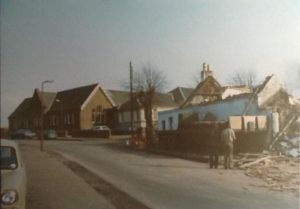 The house on the left with the roses was my Granny's house and it was called Hillview. Below that, the sliding doors went into a hall, it was either the Masonic Hall or the Shepherds Hall, I can't remember, maybe you can Norman? I only remember it as always been freezing cold in there when we went there for a party or Band of Hope. I also remember the Cooperative Hall that became the Cooperative Drapery. It's flats now but I remember the Christmas Parties in there, shivering in the wee party dress and waiting on Santa. If anyone remembers, there were several halls in Balfron, shows how the people used to socialize with one another. There's the John McLintock Hall, of course, but there was a hall across the Street which is now Scott's storage place. I think it might have been called the Waverly Hall. Then there was the old Masonic Hall, the Cooperative Hall the Shepherd's Hall. I remember the Rev Thomas Burns-Begg and his housekeeper Aggie Ronald would put on tea and iced cakes after an event. About all the shops in the village Norman, you forgot McKinnon's Tuck Shop up at the School. They had a penny tray! You are right Bill. Sweetie Jeans. I can barely remember this, but we lived above Miss Findley's shop when I was born and I remember vaguely a wee dark shop. The people who lived below us were called Mr and Mrs Mutch. We moved up near the school when I was about 5 so I don't remember it very well. One thing I do remember was the day that building was knocked down, we went down to watch it. They used a big swinging ball and it seemed to crumble so easily. My Mum told me interesting stories about during the war in Balfron. Clydebank was bombed very badly and the village folk were asked to take in a family or help in some way. The wee hoose she lived in above Miss Finley's was 2 rooms and a kitchen and she took in a family of 4! She also told me families were staying in the John McLintock Hall and in the school. The family who lived with my Mum didn't like country living and moved back to Glasgow. Lillias Walker had a shop there where the new Butcher's shop is now. Everyone ,including myself,is telling you about the co-op,from when we remember it ,which has always been at top of the village.where it still stands,but you are asking about 1917 and there is something in my memory telling me that the co-op,when it first came to Balfron, was in the building where a new shop called Wonderland now is.When I was a child in the 50s,it was a dwelling house where Jack McLintock lived.This building is just next to the co-op.My mother used to have many conversations with her cousins,the Dowies,about all the shops in Balfron,and there were a great deal of them.I think your info is correct.I,too,remember Bella Griffin.When I was a child she had a wee sweetie shop at the bottom of the village nr where the clinic now stands.There was an iron fence and you went through a gate and down some steps.When you went in to the shop,a wee bell tinkled and Bella would come through from the back place and serve you.I loved going in there with my granny on Saturdays.You told me the name of your great granda but I have never heard that name mentioned. The house on the left with the roses was my Granny's house and it was called Hillview. Below that, the sliding doors went into a hall, it was either the Masonic Hall or the Shepherds Hall, I can't remember, maybe you can Norman? I only remember it as always been freezing cold in there when we went there for a party or Band of Hope. I am trying to find out about the co-op in Balfron around the time of 1918, when my great granda was manager. I have visited Balfron and contacted many people, but no one seems able to help. I'd like to find out where the original co-op building was - not the drapery at the bottom of the hill, but the grocers. One suggestion is that it was in the building which is now a shop called Wonderland. Readers may be interested to hear that Alexander Grossert, formerly of Ballikinrain and Balfron High, passed away on 24th February aged 95. Dad's father, James Grossert, was Head Gamekeeper at Ballikinrain, to the Bryce Allan family. This was most likely in the 1920s, possibly early 30s. 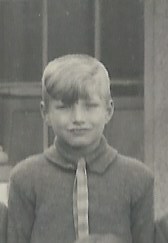 He and his brothers (Angus, George, Gordon) enjoyed a wonderful childhood at Ballikinrain and Dad always spoke about the love he had for the 'big house', the beautiful grounds and gardens and the surrounding area and his walk to school through the fields and across 'burns'. He said that the Bryce Allans were very good to his family, 'Madam' once asked him what he'd like for Christmas to which he replied 'a bike Madam'. A bike was duly delivered or Christmas Day but Dad received a 'telling off' from his Dad for asking for it! There are no surviving Grossert brothers now. 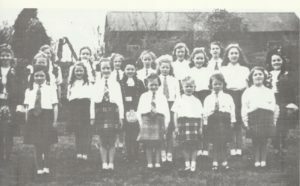 After the war, in which Dad served in the Royal Marines and The Black Watch, he trained at Glentress Forestry School. It was at one of the organised dances there that he met Mum, Helen (nee Mullins). He went on to work for the Duke of Buccleuch at Bowhill, Gerald Palmer (of Huntley and Palmer fame) on the Eling Estate, Newbury, Berkshire and latterly for the late Lord Louis Mountbatten at Broadlands, Romsey, Hampshire. In his last two appointments, he was Head Forester. He maintained his love of the outdoors and of flora and fauna right up until the end. We would love to hear from anyone who remembers any of the family or Ballikinrain at that time. I can be contacted at shonamarshall20 @ gmail.com (no gaps). Where once stood Dunmore’s Mill. The locals are playing at bowls. Commuters for most of the day. a glass, maybe somebody sings? When you find that your hair is in trouble. You would never know that they were there. But most of us just call it ……. Home! Alexander Grossert lived there as a youngster before moving to one of the lodges at Ballikinrain Castle. This would have been early 1920’s I think.